Welcome to The Strange Aeons Experiment! Order of the Amber Die is dedicated to completing published adventures. It's what we do. We don't change modules; instead, we put our labors toward bringing them to life as written. We enforce the complete Pathfinder rules set, ask no mercy from our GM, and utilize four core party members with a 15-point build. We've played through 137 published adventures at this point, and while we're looking for something fresh, we're also continually looking to push the envelope of gaming. Thus, we are attempting to play all six volumes of Strange Aeons in just nine months and document the entire journey. The Experiment: What happens when you take four players and one GM who are almost completely ignorant about all things Lovecraft, Elder Mythos, and Cthulhu and send them through Strange Aeons? We're about to find out. In fact, assembling a team of gamers that could marathon often and also meet this criteria was much harder than expected! As with almost all of our campaigns, we're playing iconic characters; knowing that James Jacobs personally selected the four iconics, we decided to play those exact four. A long weekend was blocked out for our run of "In Search of Sanity." When we arrived at the marathon location, our GM had the fog machines set up and our anticipation grew. To best immerse ourselves in an asylum lit by lanterns and candles, we played only by candlelight for the entire 44-hour marathon. We also tapped a fifth member for a cameo as Winter Klaczka, the main NPC. Going in, our history with Wes Schneider's writing was a storied one. He took down one of our favorite campaigns back in '09 when we TPKed while attempting "The Blackguard's Revenge." Two years ago, we were a few rooms inside his magma level in the Emerald Spire, when Wes took down our paladin with a caustic stalker and we barely edged out a draw. This being our third Schneider module, we had a strong desire to even-up the score. Highlights From "In Search of Sanity"
We're not sure what Call of Cthulhu is like, but we found ourselves one part scared, one part challenged by combat, and one part just plain freaked out. In a battle for a 4,000 sq. ft library, we faced off against ratlings skittering atop towering bookcases. On the first two rounds, our starknife, dart, and dagger found their marks, disrupting all 3 summon swarms. In this trial the ratlings were modified to throw anything, and they certainly threw the books at us. Our RPG skills were tested from every angle. Between a doppelganger infiltration, the worst dreams our characters have ever had, and six diseases active in the party at one time, we were just relieved to survive this cerebral horror film. Our GM reflected that being Lovecraft-ignorant was actually fresh and inspiring, and he had trouble remembering an adventure with so many new facets. In the finale, "Enter Sandman" blasted as we faced our worst nightmare-become-reality in the Tatterman. Erasmus stepped up with our best chance: Red Destiny, a magical sword now treated with silversheen and good-aligned. Not one, but two confirmed criticals made short work of a foe that is sure to flay his share of parties that come after us. The Amber Die was used sparingly, but showed its approval for Strange Aeons by delivering a natural 20 on the first attack roll of the campaign, followed by a signature 20-20 in the final hours. "Dr. Latchke," a crafty doppelganger who got around our Sense Motive, attacked the party from behind while they were distracted with a haunt. One critical hit from a claw left Erasmus depending on the champion spirit of his sister, Nissa, to guide his fighting retreat—yet the asylum's collapsed walls left the medium no choice but to leave his mortal body behind. 4 iconics with poor Fortitude saves. 3 Ghouls. 9 attacks. 1 missed save. Coup de grace. RIP Quinn. Erasmus: "Ignore the sounds in the fog, my friends, they are fear incarnate." Feiya: "I thought we met fear incarnate last night?" Despite two character deaths, our party remains strong and we secured a win. The reanimated medium archetype allowed us to welcome Erasmus back, and Quinn's raise dead is first on our to-do list. We're doing fairly well on XP, and while our treasury will take a hit, we do have some magic items left. We're hoping we can convince Winter Klaczka to join us for module two, as she would make an excellent addition to the roster. Oh yeah, and Wes: we're tied. Read through the entirety of The Strange Aeons Experiment For character builds, questions about Strange Aeons, content and more, see our thread here. Give Order of the Amber Die a Like on Facebook and follow us on Instagram. Iconic miniatures provided by Blue Table Painting. It looks like they had a tough but fun time on their hands. I can’t wait to see what happens to them when they run through "The Thrushmoor Terror." Check back here later for that report. When it said "15-point build" I LOL'd. I know, and see, so many that would be aghast at the thought of trying to build with only 15 points. That's a real horror adventure. It IS rough. But it's right, according to the developers who have said on several threads that the AP encounters are scaled to a party of 4 characters with 15-point builds. We play to the author's intent, so the same goes for the developers' intent. Your reaction is spot on--fear of death is quite prevalent for us, just like a horror game should be! It IS rough. But it's right, according to the developers who have said on several threads that the AP encounters are scaled to a party of 4 characters with 15-point builds. We play to the author's intent, so the same goes for the developers' intent. So yes, your reaction is spot on--fear of death is quite prevalent for us, just like a horror game should be! I think it's fine. It's just that so many see Pathfinder as a tactical strategy game, rather than a role playing game. If a PC isn't optimized to the hilt, they don't want to play it. If a class can't put out the numbers they want, it's a worthless class. 7 people marked this as a favorite. That's a great point, I totally agree. We've all played with people like that, and if that's how they need to play to have fun, to each their own. Many of our current members were like that at one time too, but it took years of playing optimized characters to realize that even though it made our PCs better--it didn't make our game better. The main thing we care about now is the overall experience, and we're willing to do whatever it takes to optimize THAT instead. Is there an audio or even video version of this? Ragi, thanks for asking, that helps us gauge interest in what people are looking for. We do have limited audio and video documentation just to confirm the account of what happened in each session, but it will be a little while before we are ready to release sessions online. One of the main problems we encounter is that most groups play somewhere between 4-8 hours, and we go MUCH longer. If there is enough continued interest such as yours, we'll do what we can to release a bit of A/V from our marathons. In the meantime, our Dropbox contains the main PDF of The Strange Aeons Experiment, which has a plethora of information about the project and production elements that you might be interested in. 5 people marked this as a favorite. Can I get an AMEN for brother Aerick? But like you said, to each their own. It seems to me even if you're running to the authors and developers intent with the 15-point buy, you're going to be starting the second AP at a distinct disadvantage as you're going to very gold and magic poor. I think this is going to give you a much higher risk of death than the AP intends. This will snow-ball into to later APs. 3 people marked this as a favorite. Yeah, it's definitely going to be a struggle through the next module, and I feel slightly responsible for that. I failed a save with a natural 1 and there's not much that can be done about that, it happens. The guys have done a good job at alleviating my guilt though, reminding me that we've pulled through worse odds before, so it'll just be something else we'll have to overcome. Wish us luck! You listen to Metallica while playing Pathfinder? Coeus, do it up! We use a ton of music keyed to events and characters in each of our projects. Our GM even has theme songs picked for major antagonists, allies, and encounters. We could not think of a more appropriate song while facing the Tatterman. Our game employs a huge array of sound to deepen our experience. If you're looking for some ideas check out the soundtrack section of our living PDF, here. You guys mentioned a sword called red destiny, is that from the adventure itself or just a player created item? This was a weapon found within the adventure, and was an amazing find. I can't wait to find out more about it, and why it was where it was. Named items are worth keeping, especially for the lore & roleplaying potential. I hope your curiosity is as piqued as mine. Finish an AP in just nine months?!? Damn, I wish I had that much time to game. That hasn't been the case since I was just out of high school. You're right, it's a pretty crazy schedule we create in order to pull these marathons off. All of us have careers that keep us busy, so it's a matter of planning well ahead and sticking to our dates. Speaking of high school, our first organized marathons started back then. From mom's basement to our current setup, it's been quite a journey for the Order. 9 people marked this as a favorite. Perhaps my favorite story from this marathon involves Feiya's familiar, Daji. It was late on Sunday night after a 16-hour session, and the group was pushing a little hard considering their resources. When they opened the door to the asylum's shower room, there sat Klades, a self-styled lord of ghouls (ghast with one arm). Of course Klades wasn't alone, either. A terrible fight ensued--the kind of battle you don't want to go through on low resources. One character was on the floor in the first couple of rounds, and the melee spilled out into the hallway. Feiya found herself hard pressed by a ghoul in this fight, and eventually she went down. As the witch fell, Daji the fox leapt from her side--provoking an AoO--and tore hard into the offender, tearing away chunks of decaying flesh. When the struggle for the showers was over, Daji and Alahazra faced each other, the fox standing alone atop his kill. So happy to see the Order back with an AP marathon. Inspiring stuff once again. I will be following your endeavours with interest over the next 9 months. Just wanted to say I love the attention & detail to the maps. While hand drawn at home they look professional. Happy gaming ahead!! Thank you Haldir! A TON of time went into that one in particular, so it's nice to know people notice the detail. 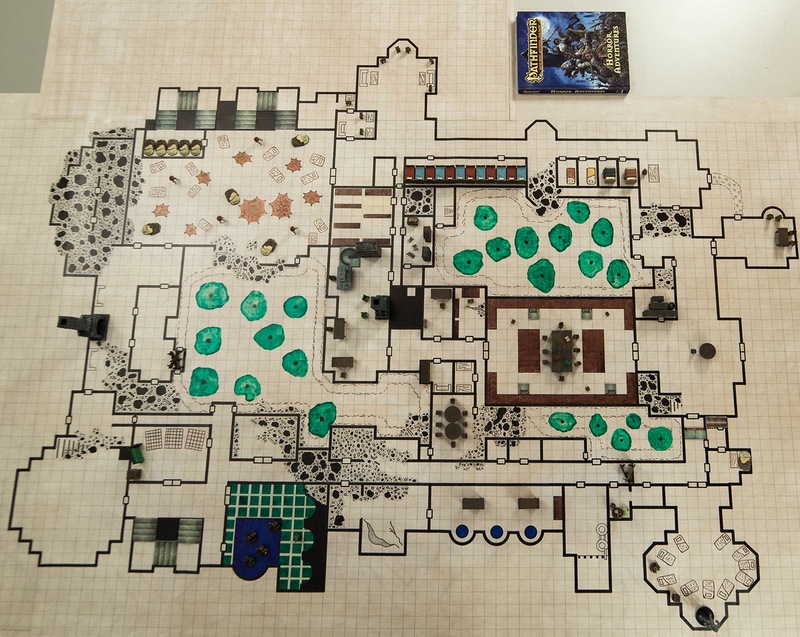 There are a bunch more photos of the map in our PDF in case GMs are looking to draw it themselves; also, I'll add a map procedure booklet to our Dropbox which will contain all the photos of the map in various stages. Hi Jim, glad to hear from you as well! We also hope your adventures in France are going well with Rise of the Runelords, and that you guys have put together a few more excellent marathons this year. We recently dropped our photos of the Storval Stairs on our Facebook, so hopefully they'll be of some use to you if you're looking to draw them. Curious now that I've read through the pdf of SAE. Where did you get the tables & chairs from? Looking for something similar for my upcoming We B4 Goblins game at ReaperCon this October. Most of our furniture is from Dwarven Forge or Hirst Arts. There are even a couple of old Heroquest pieces scattered in there, along with the occasional unique piece I might come across on Ebay or at a convention. I was hoping to add some Thomarillion furniture this year; I'd love to hear from anyone who has worked with their material. This is one of the things that still consistently impresses me about our GM! His attention to detail is painstaking, which makes the maps come to life. I realized that I said it in the emails, but didn't post here yet. This looks great!!! I love the pictures and the gorgeous map, and the whole experience looks like it was a great time. I'd love to be at that table. Can't wait to see the next session report. 6 people marked this as a favorite. So the PCs don't take all the credit here, I'd like to acknowledge one of our members who waited patiently to play the main NPC in this module. Playing with live NPCs has been one of my favorite things about the game since we started the practice. Although scheduling tends to get in the way for repeat performances, we're fortunate to have many members who are ready and willing to take on these roles and join in the action. This also adds a social dynamic to the group that usually doesn't exist among the PCs since they're usually working together towards the same goals. With live NPCs, sometimes it can be hard to tell if they're really our allies or secretly our enemies, which can cause additional tension at the table. From my experience, players tend to distrust NPCs played by GMs and become overly suspicious because it's natural to see them as adversaries, but live NPCs can blur this line and mitigate any meta-gaming that might occur otherwise. On the other side of the screen, this also frees up GMs to concentrate on preparing other parts of the module since the stat blocks are in someone else's hands, interact with other NPCs without having to talk to themselves, and focus more on the other demands of the game. For GMs or players who haven't tried this yet and think it might be a fun addition to their game--we strongly recommend it! With a party member to raise, will you be able to afford keeping it? Best of luck again, Im sure it will be a blast. I have to say in all my AP GMing experience having all 6 parts of the AP published, purchased, and read is basically a requirement to GM it. I couldn't imagine starting an AP without having read the entire path first (multiple times for me). Im curious why you jumped on this one with only 1 volume out when there are many others to choose from that are fully published and supported. I actually think running this AP, or any AP, prematurely like this will do it a disservice and makes all the hard work the developer does to keep the story coherent and intriguing for the players irrelevant since the GM will have no or little idea where the story is going and how. Yes, it absolutely helps and is important to have all six parts of the the AP published and read; that's one of the little joys about being in our position though, we get to talk with developers and authors who often provide us with additional information while we are running their modules--well, me as GM at least (evil laugh). As for why we jumped on this early, our intent is to do the same as we did for our Giantslayer Endeavor and Emerald Spire Project. We purposely blaze a trail as the AP is released, and leave behind lots of support materials and reflections of the experience for the community to benefit from. For our regular campaigns we run APs that are older, so it's been Rise of the Runelords since 2013. Those are played at mostly-normal pace (10-hour session/month), and they utilize different members of the Order. We also convert 1st and 2nd edition modules to Pathfinder, and that usually happens once or twice a year for a convention or other special event. All of this stuff is on our Facebook if you'd like to see some of the other modules and campaigns. There was a healthy amount of loot discovered, so this was actually something that was discussed between party members. We had two options in regards to loot moving forward, focus on offense or defense. I had initially voted for defense, this module has proven how important any +1 can be, but we now have the option to keep and use a named weapon no less, and that was an opportunity we couldn't turn down. Plus, Red Destiny was more than instrumental in our success through major combats, it just felt wrong to turn our backs on it. The map is so well done! Inspiring, really. Thank you! I know Haldir already referred to it as "professional," but I assure you that I am not an artist by trade. A teacher actually, so I guess I have a few ranks in Marker Use. I'm working on a PDF booklet right now that has a lot of the procedural shots depicting the process of making it over several days; it would be really neat to see other GMs try and draw it too, as all of our styles are different. The author deserves a lot of the credit here, as we GMs can only render what he has already given us. 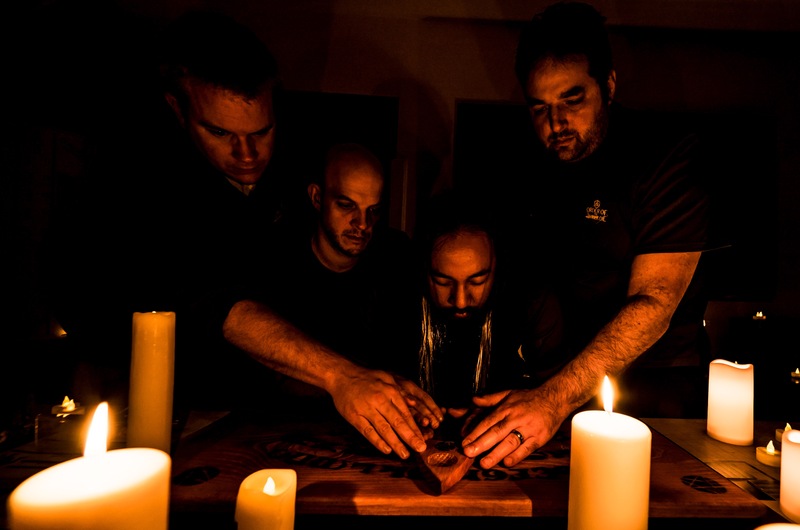 Let's not forget Rob Lazzaretti, as he is the essential middle-man between author and GM. If you're GMing this module and attempting the map, feel free to reach out with questions, and definitely share your pics! I haven't seen the group's previous marathons, so maybe this level of thought and work put into it is typical for them but I'm kinda blown away by it all. And to produce a 55 page PDF on top of the game itself! I was disappointed that there wasn't an actual account of what happened during the play-through, but perhaps that's to come later? I saw that it was a "living" document, and I know from personal experience that such write-ups can take a long time to complete. Spatula, thanks for the compliments! Our GM took over 30 hours to recreate the map. The level of detail you're seeing is something our group has always done and we decided it was time to share it with the community during our recent projects. The document is a lot of work but we try and split up the weight as much as possible and want something left behind to help other groups as they try and tackle these modules. 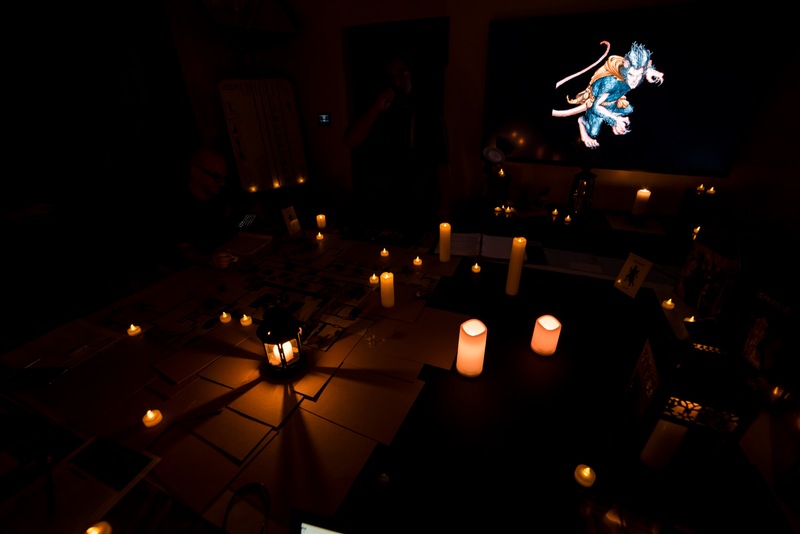 In reference to the play-through, there is some info in the Strange Aeons Experiment PDF and we will have a detailed photo-journal with captions of the whole marathon. Check our Facebook later today for the first 50 or so photos. As for the side maps and the starting area, we were able to give those some special treatment of their own which you will be able to see in the pictures as they go up. In response to all the great comments (and so many about the map), I just uploaded a short 15-page booklet to our Dropbox showing some of the procedure of how the map was produced. I tried to include many tips that were not in the booklets I made for some of the massive Giantslayer maps (also in our Dropbox). Hope it helps some GMs out there! Also, we just posted the first 50 photos from the marathon on our Facebook in case people want to see more than just these six on the blog. There’s something to be said about encountering new and strange creatures in an adventure path. The use of obscure monsters, especially unique ones in each module, helps make the game feel fresh. All you have to go by is a picture shown to you by the GM, which removes the “man vs himself” conflict with meta-gaming; there was much of that to go around in this module. At one point, when faced with something that looked awful, all I wanted to do was get everyone into the next room and shut the door to keep it outside. In the end, we discovered it wasn’t terribly hard to kill and I felt a little silly making such a big deal about it. I’ve always been an overly cautious role player when exploring, and this was both a player and character response to a horrible and unknown monstrosity trying to kill me. Going into this module, I was aware that fear was going to be a factor, I just didn’t count on how much of a driving force it would become throughout. Oh my! That's a battle mat. You're going to erase all that (30+ hours) of work. It will be gone. It might already be. Wow. I thought you drew that out on gaming paper or something. You are really nuts dedicated. That's just amazing. Swiftbrook, you are right, and have touched a chord; yes, one of the saddest parts of any marathon is having to wash off hours of hard work from my mats. However, it's also how we say goodbye to the awesome memories of so many modules over the years. Sometimes Order members who live in the area will come over and keep me company while I wash them off, other times I do it alone. Mondomats are expensive, so maybe if we weren't consuming so much material and playing so often we could keep more of them, but I have already started planning the maps for marathon 2---that's life in the Order. One thing that may help is to take a picture of the map and then you can digitally recreate it any time you want. Just cut the piece you want and print it out. Not as good as the old 30+ hour map but still nice. And if ever the table top monitor/screen becomes a cheep reality it will be ready to use again. The complete stat block(s) for Erasmus after the completion of In Search of Sanity are now available for viewing in our Dropbox, check him out! Mark, thanks for the idea! We definitely work hard to try and preserve the work put in. I'm worried the quality of this option is likely not quite where we would like to be if we have the choice. We have high resolution pictures of most of our maps, but printing them to 1" scale is rough. I've considered making a composite out of a bunch of photos, however, that would require being at exactly the same height and angle (preferably a perfect top down) for each and every picture, with no change in light. We do have the equipment to attempt it, so maybe one of these days we will kill 12+ hours trying to pull it off. Tabletop monitor has been on our radar for a while now as it would save a ton of time. Yet, the analog nature of our game is part of what makes it special. The more creative we can get in mixing mediums and still keep it on the table is what we are aiming for. Getting pictures of tabletop screens isn't great either, at least from what we have seen so far. I'm sure at some point there will be more options for us, but it is unlikely (I'm hesitant to say never because that's unrealistic) you'll ever see us using D20 or the like. It works awesome for some, but just isn't how we envision Pathfinder at its best. Re-animated medium sounds cool, but it's a shame that it's so poorly written that it's difficult to tell what it does beyond just letting you keep playing your character after death. So far it is pretty cool; when it happened, the player asked me not to say anything, so Erasmus surprised them by walking right up a hallway behind the party while they were considering entering a room. We told the other players as little as possible out of game, and made it just another creepy aspect of an already creepy module. Over time, through role-playing Erasmus explained a bit of what he understood to have happened to the other players, but they were definitely concerned when later on he dropped into a coma again for 24 hours! Those maps are amazing. I'd love a audio/visual setup! 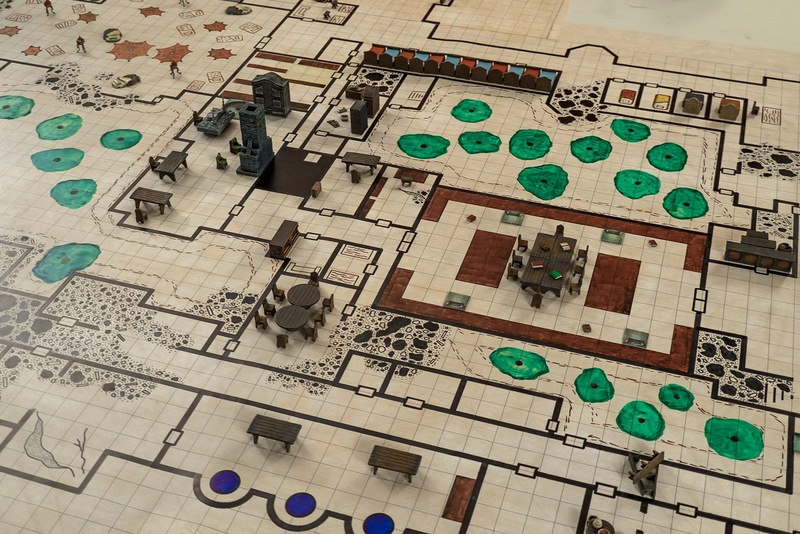 How do you not stain the battlemap up? Looks like a chessex. Yes being consistent is the hard part and can take quite a while to get right for the program you are going to use to re-create such master's pieces in the future, or allow others to do the same. I had some friends who were shooting a kickstarter video and even though that had quite a bit of TV experience they had trouble getting things to look right when trying to do it with inexpensive equipment. ie there generally is a reason for expensive things, not always but generally.